Pardon me for not writing sooner but tis the season for the paddle not the pen. I did experience some extraordinary Boundary Waters trips since the Bird Ecology seminars. 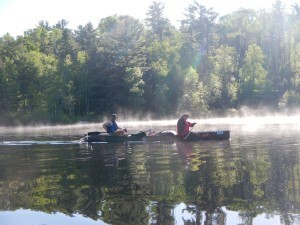 A crew from Lakeville’s Mi5 Fitness paddled a big loop in the western BWCA. It was really a fun group and we had high water. Next week a photography seminar and another great group and we had very high water. Curtain Falls was amazing. Since then, just local paddling and prepping for my Alaskan Expedtion. Dan Cooke helped me out with a giant mosquito netted tundra tarp. One of my pak canoes was lost by the USPS so it’s been a bit of a scramble getting everything ready to roll.